From the wide-open fields of sunflowers and corn stalks, to picturesque homes and subdivisions, this cozy KC metropolitan area known as Overland Park, is truly a great place to call home! While living in this wonderful community certainly has its share of aesthetic benefits, there are also many sociological benefits as well. Due to local economic stability, life in Overland Park presents many different options for families in terms of occupational, schooling, and perhaps above anything else, medical care. For many families, especially those with young children, access to the best possible medical treatment is often top priority, and dental care is obviously a major part of that. Thus, bringing us to the subject at hand; how should you select the right dentist for you and your family? Family Dentistry in Overland Park: What dentist is right for you? When selecting a family dentistry practice for you and your family, obviously there are some things to consider. In following paragraphs, we have constructed a guideline or checklist that you might find useful. While certainly no two families’ needs are identical, by considering the following criteria, may have a much better idea on what specific qualities to look for in family dentistry. In the Overland Park area, there are many family dentistry practices to choose from, so why not get some advice? Try talking to who you know, this can include; family, friends, neighbors, co-workers, or even doctors and pharmacists. By asking for recommendations, or doing some research online, you will start to get a clearer idea as to what dentists are out there, and how people feel about them. Although this might seem obvious, it is extremely important to ask yourself, what exactly are you looking for in a family dentistry practice, and what specific things do you and your family require? If you’re searching for an expedited dental service that can simply provide the necessary amount of treatment, then perhaps a large dental clinic may be the right choice. However, if you have young children or have any fears or anxieties about going to the dentist, then you should probably consider a privately-owned practice. Although a bit slower, private practices generally provide a calmer much more family friendly environment that may be preferable for children and patients who have dental anxiety. Dental insurance can be a tricky subject, and you certainly don’t want any unnecessary complications! Try finding a dentist within your network, or that may be compatible with your insurance provider. Taking the time to truly understand your health insurance benefits prior to selecting a dentist would be a good idea! While you don’t necessarily have to find a dentist within the Overland Park area, it would certainly be a good idea to do so, as there are many great practitioners in the area! Also keep in mind the commute; do you really want to drive 45 minuets for a dental appointment? Where did this dentist go to school? What types of dentistry are they qualified to do? How long have they been practicing professional dentistry? All of these questions are fair game in the selection process. Finding a dentist with whom you and your family feel comfortable with is key to building a relationship and rapport with them, so meeting with them personally is necessary. Much like the previous step, think of it as something of a job interview, is this family dentistry practice right for the job? Only you can decide! Sure, it may sound a little silly, but as alluded to earlier, the actual office and overall atmosphere of a family dentistry practice can really make a difference. This is particularly true amongst families with young children, as a cheerful and kid-friendly environment can play a major role in how children come to view going to the dentist. Family Dentistry: Let us help! At Overland Park Dentistry, we want to help you in any way we can! While Dr. Charles R. Kimes and his friendly staff would love for you to select our practice to be your family’s dental service provider, if you are still unsure, we are certainly willing to assist you in your decision making process! At Overland Park Dentistry, we understand that deciding on the right family dentistry practice for you and your family can be a bit of a challenge, so if you have questions about our services we would be more than happy to help! So please give us a call! 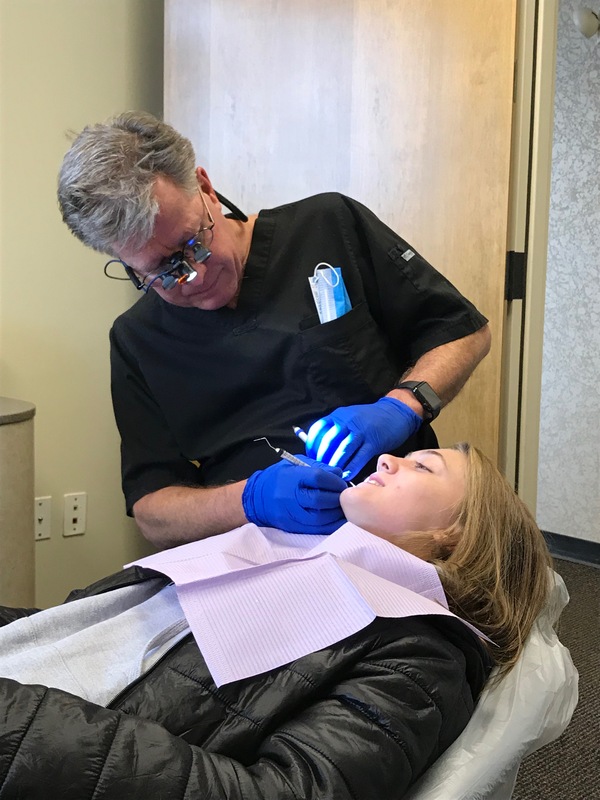 Dr. Charles R. Kimes, DDS and his expert team at Overland Park Dentistry look forward to having the opportunity to care for you and your family with any preventative, restorative or cosmetic needs you or your family may have. To schedule your dental appointment with your Overland Park Dentist, contact us at our south Overland Park office at (913) 647-8700 or our north Overland Park office at (913) 341-2380.